It’s hard to overstate LG’s dominance in 2017, especially when it came to the higher-end of the TV market. 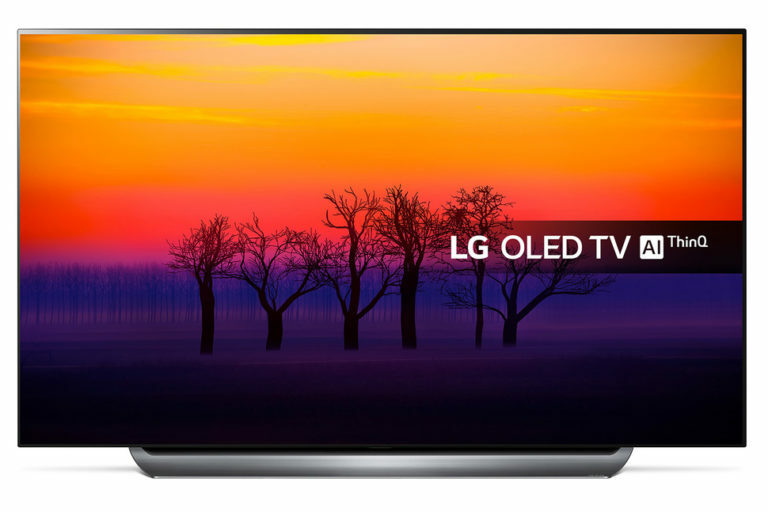 OLED, the tech praised for its ultra-rich black levels thanks to individual pixel control, was owned by LG: if you weren’t buying an LG OLED, then you were buying an OLED TV with an LG panel in it. 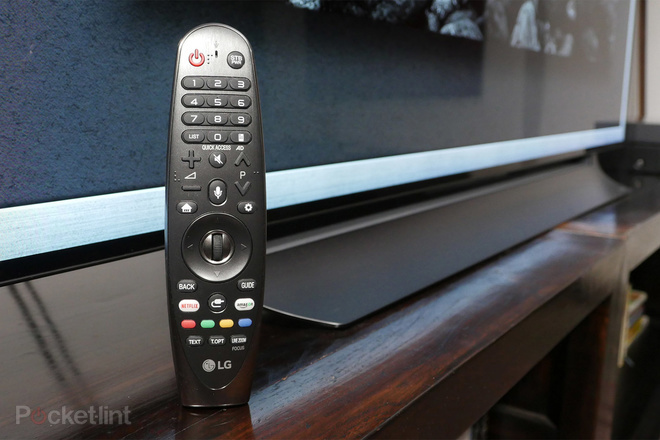 So dominant was LG that it even overtook arch-rival Samsung in terms of premium TV sales for the first time ever. In the 2017 title decider, there’s no doubt that OLED dealt Samsung’s QLED (which is the Korean company’s more advanced take on LCD) a knock-out blow. So what do you do when you’ve reached the top? You make sure you stay there. And the 2018 LG OLED C8 certainly knows how to do just that. 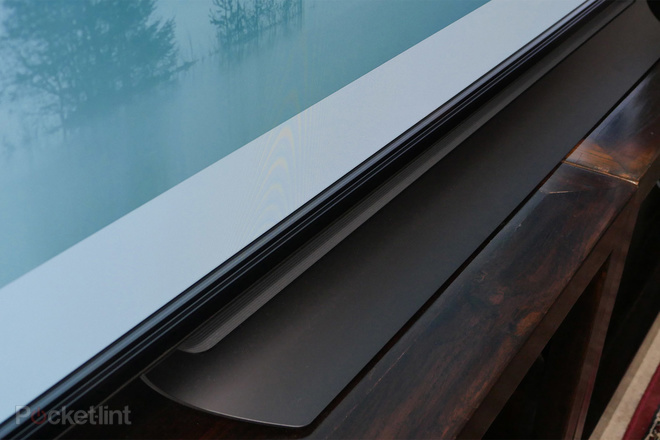 The LG design team has been on a roll recently, delivering some truly striking OLED models like the W7 wallpaper TV, which is almost paper-thin by design. The C8 is another great example, combining genuinely eye-catching elegance and simplicity, but in a more conventional stand-based format. This ultra-slim supermodel boasts a near bezel-less screen surrounded by a black metal trim. It sits on an attractive sloped Alpine stand, which is there for more than simple cosmetics, in fact playing an important role in the C8’s sound quality. The minimalist aesthetics extend to the rear of the panel, which uses a combination of brushed aluminium and dark grey plastic. There’s nothing to ruin the clean lines, and LG has tucked the connections off to the left hand side (facing the screen). The super-slim nature of the LG C8 is entirely thanks to its OLED panel being self-emissive. This means every single pixel lights up, essentially creating a screen with eight million individual dimming zones. 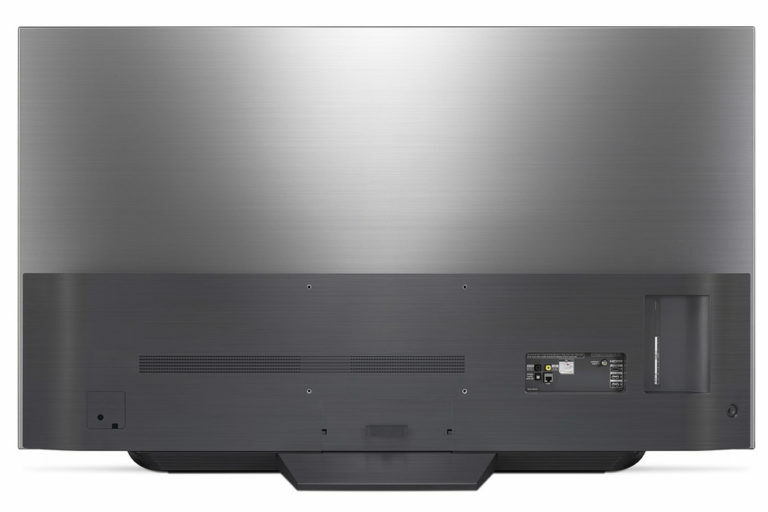 That easily beats the local dimming system of any LCD TV, such as those from Samsung, delivering incredibly deep blacks, precise highlights and very wide viewing angles. New for 2018 is the Alpha 9 processor, which delivers superior upscaling that can make even the worst standard definition (SD) content bearable. Give it some decent content to work with and the intelligent processor can really impress, with high-definition (HD) images looking almost 4K ultra high-definition (UHD) in terms of their resolution. LG has added a few new image processing options this year, including a de-contouring feature that can effectively remove banding inherent in certain content. That’s not all, because if you hate grain in your picture then the Alpha 9 includes some souped-up noise reduction that can deliver clean and detailed images. There’s also a new setting called Motion Pro, which uses black frame insertion to improve motion handling. This literally inserts a black frame between every frame, which does help with motion. But because of the added black frames, the image darkens and some users may experience flicker. Finally there’s an auto-calibration feature that provides professional calibrators (or gifted amateurs who own the necessary equipment) with the ability to create incredibly accurate images at the push of a button. However, despite all this new processing power, the Game mode can bypass most of it. 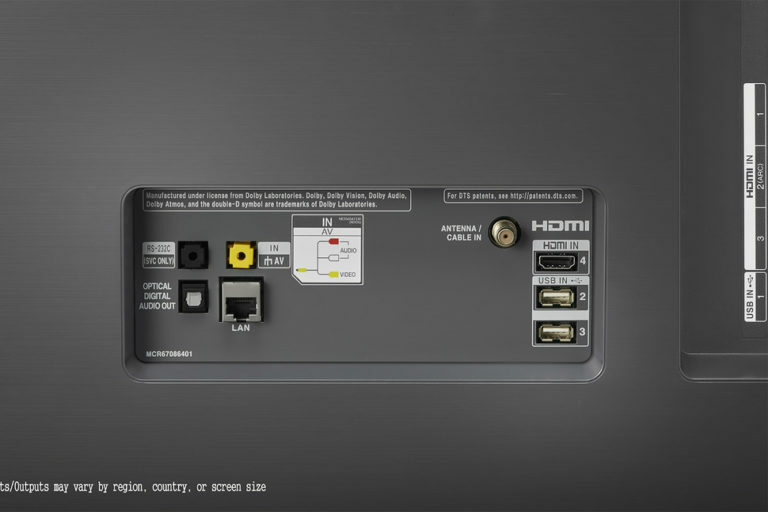 As a result the input lag is an incredibly low 21ms, regardless of whether you’re gaming in HD, 4K, high dynamic range (HDR) or standard dynamic range (SDR). So if you’re a big gamer, then the C8 is definitely worth considering. The black levels on an OLED TV are truly something to behold, providing a contrast performance. With the C8 it really is second to none. Not only are its blacks deep, but the TV manages to retain information just above black to deliver that all-important shadow detail. The image is also bright, especially where standard dynamic range (SDR) content is concerned, and when combined with those blacks, results in a picture that has both depth and impact. The colour performance is equally as impressive, with saturated images that provide a beautifully natural and dynamic picture. Colours are strong and punchy with bright scenes, but a key strength of OLED is its ability to retain accurate colours even when the image is very dark. This is something with which LCD TVs struggle, due to light spill from their LED backlights. With HDR content, the C8 is often a revelation. Not only is the native 4K panel able to take full advantage of all that additional resolution, but the inherent contrast advantages of OLED come to the fore. And HDR is about more than just brightness – there is as much extra picture information in the darker parts of an HDR image as there are in the brighter areas, so an OLED TV is particularly good at revealing all this additional darker information. However, thanks to the picture being created at a pixel level, it’s also capable of precise delivery of those tiny bright highlights that make an HDR image look so realistic. That’s the secret to why the C8’s HDR images look so good; it can retain the deep blacks and the peak highlights within the same image, resulting in exceptional dynamic range. The C8 also includes a brilliant feature called Dynamic Tone Mapping, which although available on 2017’s LG OLED TVs has been vastly improved for the 2018 line-up. It analyses an HDR10 image and adjusts the tone mapping on a scene-by-scene basis, optimising the HDR image for the OLED panel. This feature basically mimics the way that dynamic metadata behaves; and boy does it work, creating breathtaking HDR images. However, if you want to benefit from genuine dynamic metadata, the C8 also supports Dolby Vision. This format has gained real traction over the last year, and is now heavily supported by Netflix, iTunes and 4K Blu-ray. It also works extremely well, delivering a finely-tuned performance that retains more detail in both the dark and brighter parts of the image. HDR will soon be revolutionising broadcast TV, thanks to Hybrid Log-Gamma (HLG). This backwards-compatible version of HDR has been co-developed by the BBC, which is already trialing it. The C8 supports HLG via the BBC iPlayer, and the test footage currently available provides a tantalising glimpse of the future. It’s a testament to the quality of the C8 that there are so few issues worth mentioning, and what issues there are relate to the inherent limitations of OLED: though the technology can deliver incredibly deep blacks, it does struggle to reach the peak brightness numbers seen on many LCD TVs. At best an OLED can deliver peak highlights that measure 1,000nits which, while not bad, is a long way off the 2,000nits that certain LCD TVs can achieve. An OLED will also struggle to light the whole screen, so a bright snow-covered field will prove a challenge, whereas an LCD TV won’t break a sweat. However, it has to said that the Dynamic Tone Mapping feature mentioned previously goes a long way towards addressing both these limitations. LG’s OLED tellies support just about every version of HDR imaginable, but don’t include HDR10+. Whether this is a big deal remains to be seen, as the jury is still out on this new version of HDR (which is currently only used by Amazon). Dolby Vision, which the C8 does support (and many other brands do not), offers the same benefits and is widely used already by Netflix, Amazon, iTunes and every major studio. The self-emissive nature of OLED means that it could theoretically suffer from image retention or screen burn, too. LG has taken measures to mitigate this risk, but it’s still worth considering, especially if you game for hours on end. It’s also worth pointing out that every 2018 LG OLED TV above the C8 has the same panel and image quality, so spending more doesn’t make for better pictures – the other sets merely offer more sophisticated integrated sound and design elements. The B8, however, lacks the processing smarts of the 2018 line-up, thus is a little cheaper, yet on par with 2017’s B7. If imitation is the sincerest form of flattery, then LG’s WebOS must be blushing right now. 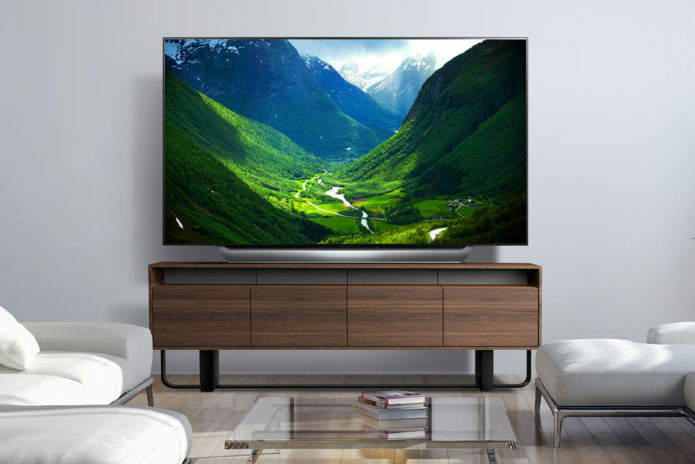 This Smart TV platform has been hugely influential since its launch in 2014, and was so good from the start that LG has felt little need to change it in the intervening four years. Indeed, others have begun to copy. WebOS is simply the best and most intuitive Smart TV platform available. Its launcher bar is quick and easy to navigate, ensuring that even the most technophobic user will be operating the system like a pro in minutes. Much of the platform’s success is down to the Magic Remote, an ergonomically-designed and highly effective motion-controller. It’s so good that after 10 minutes using one, any other controller feels like it came from the Stone Age. WebOS supports every major video streaming service including Netflix, Amazon, Now TV and YouTube, along with all the UK catch-up services thanks to Freeview Play. In the case of Amazon, YouTube and Netflix there’s 4K and HDR support, with the last of this trio even adding Dolby Vision and Dolby Atmos. As already mentioned, there’s also HLG support for the BBC’s iPlayer. New to the 2018 line-up is the addition of ThinQ AI (Artificial Intelligence), which not only includes improved recommendation features by analysing your viewing habits, but also allows for communication and control of other ThinQ compatible devices. Another benefit of LG’s AI smarts is sophisticated natural speech recognition, which allows you to voice control your TV in a more conversational manner. The microphone is built into the Magic Remote, and while it’s easier to use the controller for some functions, voice control is sometimes ideal for content searches. We’ve got so used to modern TVs sounding rubbish that it comes as a real surprise when one actually sounds good. Given the super-slim proportions of the C8, we weren’t expecting much on the audio front, but couldn’t have been more wrong. That sloped stand really makes a difference, re-directing the downward-firing speakers forwards, giving the audio a bigger and more immersive front soundstage. The 65-inch larger screen size helps as well, creating a better sense of stereo separation, with some excellent detail. The 2.2-channel speaker system and 40W of amplification pack a punch, so the LG C8 can go quite loud without sounding harsh. The mid-range is well defined, too, so dialogue always sounds clear and focused on the screen, while the higher frequencies are also nicely represented. There’s even a decent bass presence that gives the overall sound field a solid foundation, allowing action-packed soundtracks to feel bigger and more dynamic. The C8 can’t compete with a separate subwoofer, of course, but it certainly has enough presence to handle the majority of TV programmes. LG is one of the few TV manufacturers to offer Dolby Atmos support, and while it would be unrealistic to expect a TV to deliver the kind of immersive experience a proper Atmos system can, it’s actually quite convincing. There’s a well-rounded balance to the sound, making certain effects seem to emanate from the sides and even from above. 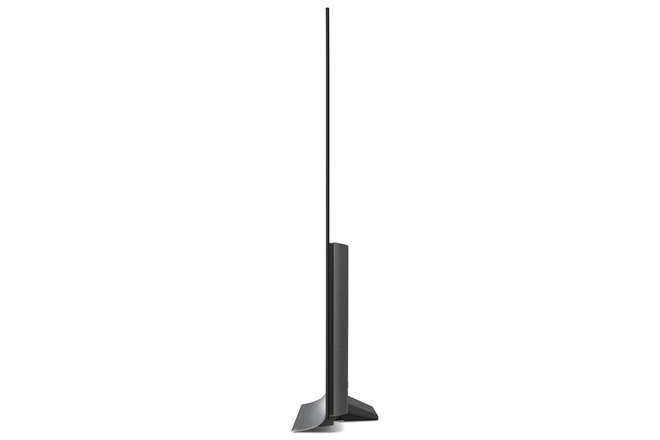 LG has consolidated its position at the top of the premium TV tree and, in doing so, has delivered a highly capable and comprehensively featured OLED TV. The C8 builds on the success of last year’s B7 and C7, delivering an even better picture, better sound and better features. Samsung’s QLED range might be capable of a superior HDR experience thanks to its increased brightness, but LG’s use of OLED means deep blacks are better, while precise highlights are just as good. LG also supports almost every form of HDR, and its Dynamic Tone Mapping is nothing short of a revelation. 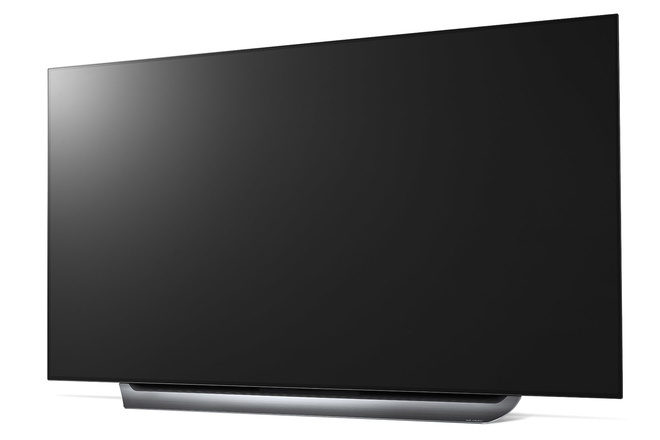 Once you consider the gorgeous design, fantastic WebOS smart platform, comprehensive set of video streaming services and Dolby Atmos support, you’ve got a TV that will prove very hard to beat this year. It’s an OLED revelation. 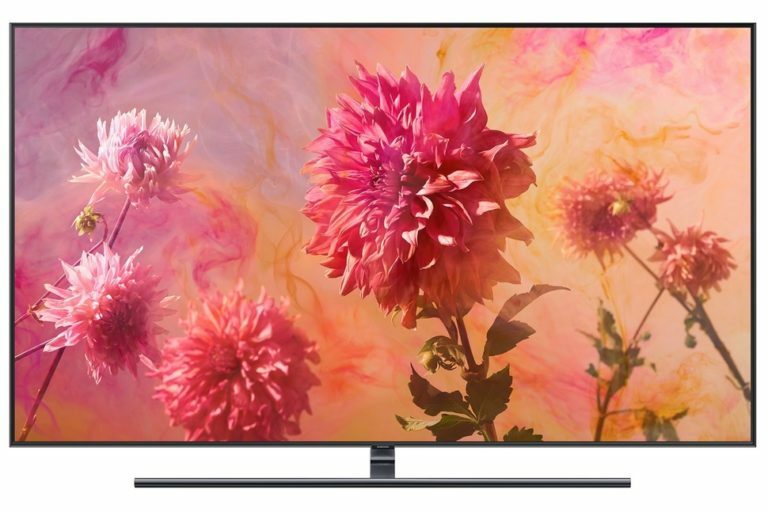 If you’re format-agnostic when it comes to OLED versus QLED, then Samsung’s new Q9FN telly is definitely worth considering. It uses a direct backlight and sophisticated local dimming to deliver a contrast performance that approaches that of OLED, but is capable of much brighter HDR images. It also has some great features for gamers, but its optimal viewing angles are very limited, so do bear that in mind.